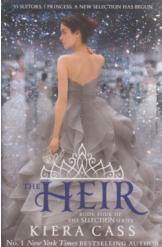 The Heir by Kiera Cass, Sci Fi. Growing up with the stories of how her parents Prince Maxon and America Singer met in a Selection, Princess Eadlyn now faces a Selection of her own. Book four of the "Selection" series. Book is in good condition, all pages intact.